The Liebster Award is an award given to bloggers by bloggers. It’s a pay-it-forward-way to encourage fellow writers to keep writing. Given to bloggers with less than 200 followers, the award’s origins are clouded in mystery. To receive the award you must answer your nominator’s questions on your blog and then nominate three bloggers to receive the award. Thank you to genealogy blogger Gary Roberts (http://backtrackingthecommon.com) who focuses on his fascinating family history originating in the Southwestern part of the United States. My motivations mostly stems from one of my career goals, which is to become a professional family history that publishes family sketches, brick wall methodologies, and genealogy tips for society publications/periodicals. I also draw a lot of inspiration from the desire to document my family history and tell the stories of my ancestors. When I started my genealogy blog in late 2008, it was in part to supplement the research of my high school senior project on genealogy. That year was particularly busy; I was able to keep a log of my many research trips, such as NARA and Library of Congress in Washington D.C. I found myself post new findings about my ancestors almost daily. The warm feedback I received from the community about my blog page has inspired me to keep writing. Working at home as a genealogist is great because it allows me to share and connect with family members about our history. We enjoy hiking and taking care of two dogs, Mike and Daisy. 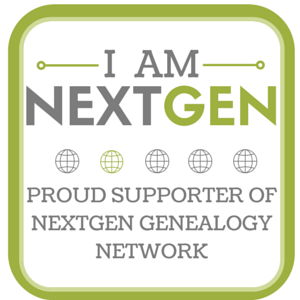 My family has supported my dreams to become a genealogist and I am grateful for their support. What is the favorite blog post you’ve written and please share a link to it? Blogging is an excellent medium to present the genealogist’s research process. Writing in itself is a very engaging activity and will allow our brain to see complex research problems in new ways. You may find yourself in the midst of writing about an ancestor that you had not looked for a particular set of details about their life. Concerning the research of my family tree, I have not added every footnote and document I have come across. My blog posts happen when I say to myself that I need to explore what I am finding deeper. Writing about my methods allows me to self-reflect and analyze my own methodologies. Research into other genealogy topics has also led me to using my blog as a forum to share important genealogy resources to the community. Practicing something daily that allows you to disengage from the noise of modern life is important to your health. I have nominated three prolific bloggers for the Liebster Award and they are…. When did you decide to start a blog and what is the emphasis of for your blog? Describe how blogging and research influence each other. List a few of your favorite blogs. What goals do you have for your blog in the next year? What is your favorite post that you have written? What are three interests/hobbies of yours outside of blogging and family history?